Over the past year I've come to really admire Lindsey Bugbee, the lovely designer/illustrator/calligrapher/entrepreneur behind The Postman's Knock. Not only is she a big reason why I've decided to learn calligraphy this year, but every post she writes is filled with kindness, dedication and encouragement. Needless to say, I was really excited when she proposed a Creative Challenge for the month of January, with some awesome prizes to boot! It would be the perfect way to stay focused on creating, and was an extra challenge because of my limited paper/art supplies that I have with me here in France. Main guidelines: "Either print off the TPK botanical border goal list template, or make your own list with illustrated elements or pretty calligraphy—or both!" I printed off the goal list template that Lindsey had made, and wrote out my main three resolutions of 2016 in faux calligraphy. To decorate, I used the only colors I currently have on-hand: some thin markers that I've lugged around with me back and forth to Spain, Korea and now France. Main guidelines: "Make a drawing or illustration in any medium such as watercolor, pencil, crayon, colored pencil, pastel, etc. The subject of the piece should be challenging for you to make and should require more than a few minutes of your time." 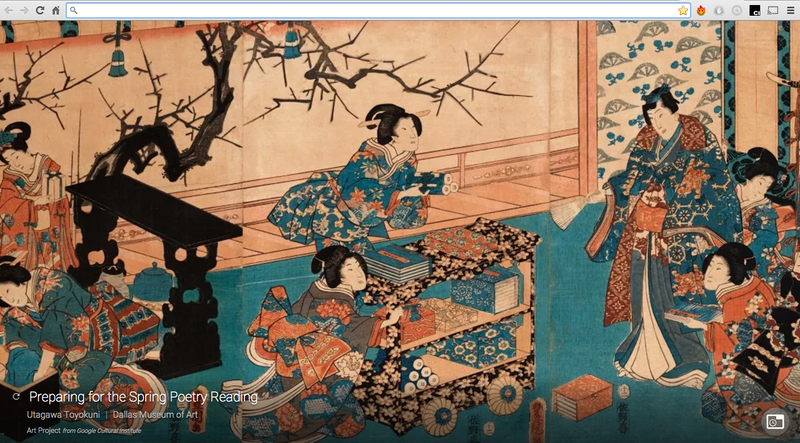 About a month ago, I added the Google Art Project extension to Chrome. Now, every time I open a new tab, I see a painting from the Google Cultural Institute. It was a really simple way to get me seeing something new every day, even if just for a few seconds. One day this month, the featured painting was "Preparing for the Spring Poetry Reading" by Utagawa Toyokuni (Dallas Museum of Art), and it caught my eye. I decided to try and recreate it for this illustration challenge. Main guidelines: "Make whatever style of card you want to (watercolor, decoupaged, etc. ); you have the option of making a postcard instead of a greeting card if you wish." I grabbed a piece of white A4 printing paper—what we have—and folded it twice into your standard card size as a base. I wanted to use magazine cut-outs or junk ads to make the featured word, but we had nothing of the sort in our apartment. Then I browsed some of Lindsey's card posts and ended up using the second card from this post as inspiration. I ripped out a page from the front pages of an old French novel I'd bought for cheap over the weekend at my go-to used bookstore in Montpellier, and used that as the background. Then I cut a strip from a leftover green notecard from the Christmas cards I'd sent out in December for that "hello" background. Finally, remember that art gallery Damien and I went to earlier in the month? The artist actually gave me her business card when we were done talking that evening, which featured the lovely painting you see on my card. So, yes, I cut off her name and contact info to use it for this creative challenge. Heh. It was for the sake of art! Main guidelines: "Make a creative and/or artistic envelope, preferably with some sort of calligraphy or thoughtful hand-lettering. You may make a DIY envelope or draw/calligraph on a commercial envelope. Totally up to you!" I followed Lindsey's roses and swirls tutorial to decorate the remaining space on the envelope after I'd written the address angled and in faux calligraphy. Pretty cool challenge, eh? I thought so. This challenge has since ended, but if you're interested you can follow The Postman's Knock blog so as not to miss out on any future creative challenges. Have you ever participated in a challenge to push yourself to build new skills or to take enjoyment in a hobby more frequently? Or has anyone organized a challenge for a community? I'd love to hear about it!